After a fabulous picnic dinner spread, we played a new boardgame i got from my friend stephanie! (Thank you Stephanie - I love it!!) The game is called Winerd and can be found wherever boardgames are sold or online. 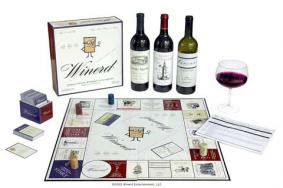 If you're looking to brush up on your wine trivia or play a non-college frat party "drinking game," then this is a game you'll want to check out! What's fruity and jiggles when it's drunk? Kudos if you guessed a fruity gelatin dish made with wine! (Haha!) Stina captures the flavors of peach & raspberry with a hint of white wine in her entry to the picnic party. To see how she makes it, check out her blog! Laura joins us to share two of her favorite Italian dishes. Her Chicken Cutlets with Spinach and Tomato Basil Sauce are not only quick to make but I really like how they use white wine ! These are recipes I want to make soon. Check out her blog for the recipes so you can make them too! Kate shares her recipe for lemon squares even though she's not a fan of lemons. She made these treats for someone special and decided to share them with us too! To find out who she made these for and why, check out her blog and the recipe! 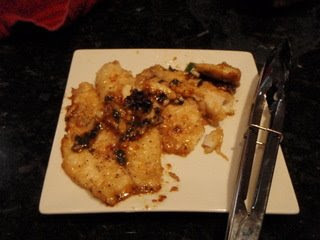 Karen joins us with a dish that prepares fish in a refreshing way. I'm a big fan of fish and seafood so I'm looking forward to trying this recipe soon. For the recipe, check out Karen's blog! I would have love to go to that one! Mmm... everything looks fabulous! I love white truck - that's a great wine to serve.